Friends from College should be one of the best new Netflix shows of 2017. Everything from the casting to the writing feels designed for something greater, but like its characters, the series relies too much on the past and can't seem to say anything new. Eight episodes were provided prior to broadcast. I’m of the strong belief that some of the best entertainment drama and comedy comes from creators who are uniquely connected to the material. 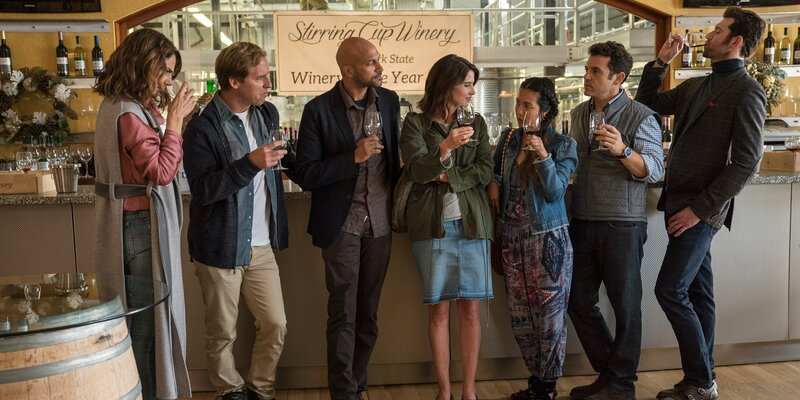 So it’s a weird surprise to find that Netflix’s newest original series, Friends From College, ultimately comes short of that exact expectation, as it was created by husband-wife duo Nicholas Stoller and Francesca Delbanco and follows the lives of an aging friend group coming to terms with their dysfunctional attachments to one another. Stoller is best known for his major comedy breakthroughs on the big screen, including Forgetting Sarah Marshall, both Neighbors movies, and even the high-concept animated film Storks from last year. But Friends from College is perhaps a bit more akin to his movie The Five-Year Engagement, which straddles the line between drama and comedy without feeling like too much of either. On the surface, the show’s premise is a bit simpler than what you may expect from the pedigree of this cast. Married couple Ethan and Lisa (played by Keegan-Michael Key and Cobie Smulders) met in college but eventually moved away to Chicago. Ethan had aspirations to become a bestselling novelist, but his dreams have come up short, so the couple has recently decided to move back to New York for a fresh start…maybe, as it’s hard to tell why they’re really in on this move because it’s a big decision that happens offscreen. Back in New York, they instantly reconnect with their friend group from college, and it’s immediately clear that there’s some emotional, especially romantic, baggage between these longtime friends who’ve never gone out of touch with each other. Ethan has even been in a years-long affair with Sam (played by Annie Parisse), who is also married, but to someone outside their group of friends. The two decide to break off their affair after realizing they’ll be in the same city once again, but as you can probably guess, that’s not a proposition meant to last. While it takes several episodes for this major storyline to reveal its true colors, the rest of the friend group gets much less to do despite some groundwork laid for a compelling ensemble. Like Sam, Max (played by Fred Savage) is in a relationship with someone outside the core group (Billy Eichner) who struggles to grasp the unusual clinginess going in with these college friends. Max is also trying to help Ethan relaunch his career as a novelist, urging him to sell out and write young adult novels for his publishing house. Despite getting short shrift for most of the season, Max does come away with one of the best scenes, which is a coke-fueled tap dance that should have been the basis for the entire show. Marianne (played by Jae Suh Park) is squandered even more for most of the series, serving as the friend who houses Ethan and Lisa while they search for an apartment of their own. She’s also one of the first to know about the affair between Sam and Ethan, despite never bothering to do anything about it over the course of several years and…well, you can see how this series’ web of relationships and drama can get just complicated enough to justify a full sitcom season, but it’s mostly just information, as opposed to well-written set pieces and character work. And we haven’t even gotten to Nick (played by Nat Faxon), who can usually steal any scene with his refreshing brand of comedy. Ethan and Sam in particular are incredibly messy characters who don’t even address the obvious problems with their infidelity until the audience has shouted it at their Netflix browser for about the tenth time. While Sam is absolutely salvageable thanks to Parisse’s keen take on the character, Ethan is just a step too unlikable, even though Key is firing on most cylinders with the material he’s given. Stoller, who also wrote for the show, appears intent on telling this story in media res, hoping the viewer will catch up without the need of any critical exposition. It’s a worthy goal if done right, but it leads to more confusion of motivations than it does to preserve genuine dialogue, and scenes that should have been more potent and worth discussing with fellow fans feel lacking and obtuse. At the very least, Friends from College manages to have its fair share of funny moments, especially when getting into a consistent flow of levity. It’s just a shame that these scenes often sidestep into intentionally cringe-inducing drama that needs a better evaluation of the stakes. It would be easier to sympathize with Ethan and Sam if we had spent more time with them building up to the decisions that would make them reevaluate their relationships with each other and their spouses, but because this is meant to be an ensemble, there just isn’t the time needed for this show to flesh out its thesis and reason for being. It’s a missed opportunity hurt further by the extraordinary talent of a cast that deserves a better show to take advantage of their obvious chemistry.